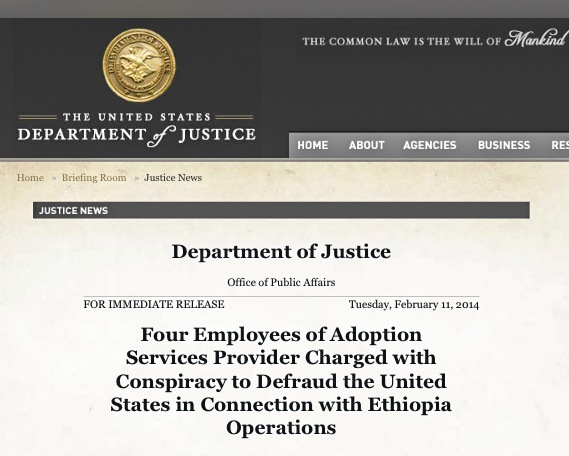 In February 2014, four employees of the US adoption agency International Adoption Guides (IAG) were indicted for fraud by the US Department of Justice. Three former IAG staff members–Mary Mooney (IAG Executive Director), James Harding (IAG International Programs Director), and Alisa Bivens (IAG Ethiopian program director in the US)–were arrested. Haile Mekonnen, the IAG program director in Ethiopia, remains in Ethiopia and has not yet been arrested. Mooney and Harding’s trial (before Judge Sol Blatt in US District Court, Charleston, SC) is scheduled to begin September 16. Alisa Bivens will go to court (also before Judge Blatt) on August 7 and plead guilty. I’m not a lawyer, but this looks to me like Bivens has agreed to plead guilty so as not to go to trial and perhaps will now receive a lesser punishment. I have no insights as to whether she provided information about the other defendants, or if they provided it about her, but that is not an uncommon scenario. Also, many criminal cases these days never go to trial, but are resolved through a plea agreement. That could certainly happen in regard to Mooney and Harding, right up to the time the trial is scheduled to begin. What did all these people do, between 2006 and 2011, according to the Department of Justice? They also damaged the lives of many families in the United States and in Ethiopia. Allegations like these, drawn over years from the interviews and experiences of many IAG clients, are tragic in their impact. Victims–anyone affected by the alleged fraud of IAG–are strongly encouraged to speak up. Victims will be allowed to speak at Alisa Bivens’ plea hearing. I hope that many will be able to do so, either by actually being in court August 7, or by contacting the Department of Justice and the Office of Children’s Issues. Additional charges could be filed against Harding and Mooney, so it’s not too late for anyone to offer information. Please speak up. The bribery, fraud, counterfeiting, and lies are almost overwhelming. How deep did all this corruption spread in the US and in Ethiopia? How can international adoption continue under clouds like these, along with what happened to Hana Williams and the Barbour children, as well as Tarikuwa Lemma and too many others? What more do we need to know to demand that international adoption policy be overhauled if we are going to genuinely meet the needs of vulnerable children and families?